Home|Floral Library|Nemesia – Nemesia spp. Decorative Life: Can last 4-6 weeks depending on garden environment. Treating plants with AVG, an ethylene synthesis inhibitor, helped maintain the plants in a vegetative state such that cuttings could be produced. As a member of the Scrophulariaceae (figwort family), some of its common relatives include foxglove, Veronica, Penstemon and Calceolaria. Native to mostly South Africa. Flowers are flat, less than 1 inch across, in sprays at stem ends. This species produces many flowers under many growing conditions. It is a day neutral plant. Stems are leafy, to 12 inches tall, plant is classed as a dicotyledon. N. fruticans has vanilla-scented flowers while other species vary in their flower fragrances. Should be stored at 50F. Many species in this 3000 plus species family are grown for ornamental and medicinal purposes including slipperwort, speedwell, mullein, bearded-tongue, foxglove, snapdragon, toadflax, monkey-flower, cape-fuchsia, coral-plant and blue-lips. 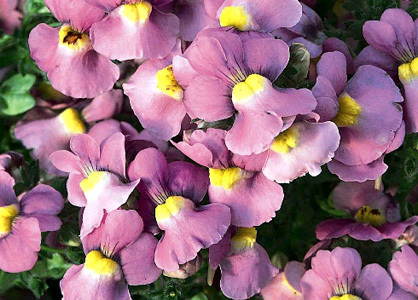 Nemesia was a name used by Dioscorides. N. strumosa is the most common garden species. Some favorite cultivars and their respective flower colors include ‘Compact Innocence’ (white) and ‘Blue Bird’. Will generally do well in light levels at least bright enough to read a newspaper in comfort but more light (up to filtered full sunlight) would be better.